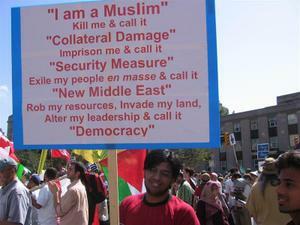 Protestors gather outside the Israeli consulate in Toronto, Canada; Aug. 12, 2006. 1. "We have nothing to fear from anyone on this living planet. Fear is the greatest impediment to the achievement of peace. We have nothing to fear from people who are different from us, from people who live in other countries, even from the people who run our government.... We can speak truth to power, we can allow our humanity always to come before our nationality, we can refuse to let fear invade our lives and to goad us on to destroy the lives of others." -- Jean Rohe, Why I Spoke Up, 20 May 2006. 2. "Of the over one thousand British Muslims arrested under anti-terrorist legislation, only twelve per cent are ever charged with anything. That is simply harrassment of Muslims on an appalling scale. Of those charged, 80% are acquitted. Most of the very few - just over two per cent of arrests - who are convicted, are not convicted of anything to do terrorism, but of some minor offence the Police happened upon while trawling through the wreck of the lives they had shattered". -- Amb. Craig Murray, The UK Terror plot: What's Really Going On?, 15 Aug 2006. "He was clearly a Hasidic Jew," said Yves Faguy, a passenger seated nearby. "He had some sort of cover over his head. He was reading from a book.... The action didn't seem to bother anyone, Faguy said, but a flight attendant approached the man and told him his praying was making other passengers nervous. "The attendant actually recognized out loud that he wasn't a Muslim and that she was sorry for the situation but they had to ask him to leave," Faguy said. British holidaymakers staged an unprecedented mutiny - refusing to allow their flight to take off until two men they feared were terrorists were forcibly removed. The extraordinary scenes happened after some of the 150 passengers on a Malaga-Manchester flight overheard two men of Asian appearance apparently talking Arabic....The Monarch pilot - a highly experienced captain - accompanied by armed Civil Guard police and airport security staff, approached the two men and took their passports. Half an hour later, police returned and escorted the two Asian passengers off the jet. Soon afterwards, the aircraft was cleared while police did a thorough security sweep. Nothing was found and the plane took off - three hours late and without the two men on board. A Spanish university professor with a long beard and dark complexion said Thursday he was briefly forced off an airliner during a layover on the Spanish island of Mallorca by passengers who feared he was an Islamic terrorist. Photo credit: No idea, sorry. Pse email if you are the person who sent me this.